Obtain a superior network signal anywhere in your home or office by maximizing your signal booster's functionality with the 2-Way Splitter with N-Female Connector from weBoost. It splits the amplified signal of your weBoost amplifier to increase area coverage. Designed for use in signal distribution systems, this splitter facilitates equal distribution of signals through multiple antennas for coverage of similarly sized areas. 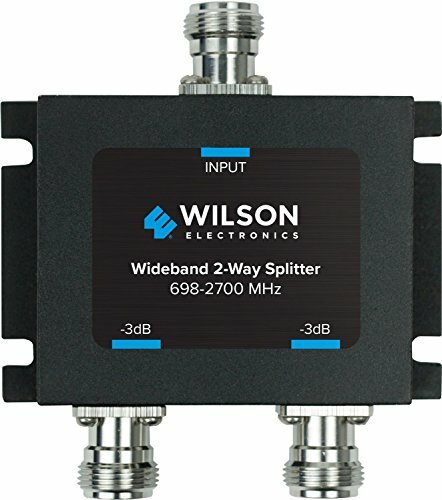 Designed to work with antennas, amplifiers, and accessories with an impedance of 50 Ohm, this splitter works on all carriers anywhere in the U.S. and Canada – AT&T, T-Mobile, Verizon, Sprint, and U.S. Cellular. It’s guaranteed to give you enhanced call quality and superior data connectivity by providing your antennas and amplifiers with improved coverage. This splitter features a durable, ergonomically designed chassis that facilitates stable transfer of signals with minimum signal loss. The N-Female connector of this splitter allows efficient and speedy transfer of high-frequency information. The female connector quickly receives large amounts of data and can work at radio frequencies in the multi-megahertz range. This splitter measures 4.4 inches in length, 2.8 inches in width, and 1.1 inches in height. Our products come with seven-day-a-week support and a two-year warranty. Our technical staff will provide you with whatever assistance you need. WeBoost is committed to improving the lives of our customers, and this splitter will give you a superior cellular signal in every corner of your home or office. However, if you are not satisfied with your purchase, we will be happy to give you a full refund within 30 days. Expand the coverage of your signal booster and enjoy superior cellular network and data coverage with this splitter from weBoost! STURDY WIDEBAND SPLITTER - This durable splitter is made from premium metal and measures 4.4 inches in length, 2.8 inches in width, and 1.1 inches in height. Unlike other coax splitters, this one has a sleek design that maximizes signal integrity for consistently stable cellular signal strength. DESIGNED FOR USE WITH 50-OHM AMPLIFIERS - Designed for use in signal distribution systems, this splitter works with 50-Ohm amplifiers and accessories. It facilitates equal distribution of signals sent to multiple antennas for similarly sized areas, while also reducing the amount of signal loss. WORKS ON ALL CARRIERS - This splitter is designed for antennas with 50-Ohm impedance. Designed to be used with an antenna and amplifier, it works on all carriers - AT&T, T-Mobile, Verizon, Sprint, and U.S. Cellular. The splitter is guaranteed to increase your antenna's or amplifier's coverage, giving you enhanced call quality and superior data connectivity. N-FEMALE CONNECTOR - The weBoost 2-Way Splitter features an N-Female connector with a threaded, weatherproof structure. The female connector quickly receives large amounts of data and works at radio frequencies in the multi-megahertz range. EXCELLENT AFTER-SALES SERVICE - This splitter is designed to split an amplified signal to multiple antennas with minimum signal loss. It effectively splits signals from antennas with a signal loss of as low as -3 decibels. It comes with seven-day-a-week support and a two-year warranty. If you have any questions about this product by weBoost, contact us by completing and submitting the form below. If you are looking for a specif part number, please include it with your message.